MWD Ciba/H181 (Patrol) - 8th SFS, Kunsan AB, ROK. Ciba was my second MWD that I was partnered with, she was certified in only Patrol work. She has to be one of the most loyal/loving dogs that I have worked with. She was "My" dog. Some of my best memories of Ciba were when we would post out to the perimeter of the base and pull LP/OP duties or patrols on the beach in the heat, snow or rain. The last exercise that we worked together it was snowing, there was at least 2 ft already on the ground and it was still coming down hard. Anyone that has been stationed in Korea can vividly recall how cold it gets. But there is no place that I would rather be with Ciba. I always made sure that my partner was warm/comfortable, before I was. I must have carried on hours of conversation with Ciba and she would just look up at me like she understood what I was talking about. There isn't a day that goes by that I don't think about her and all the good times we had together. comments MWD Dani/D054 (EDD/Patrol) - 341st SFS/Malmstrom AFB. MT. I never got the chance to deploy with Dani, wish I had. He was my first dog in the two years we were partnered we had fun while working together. My best memories are of Dani sticking his head in the snow banks around base while we were conducting out foot patrols/checks around the base at night.His favorite time of the year was Christmas when we would ride through the housing areas making our rounds and he would bark/growl at the mechanical reindeer that people would decorate their yards with.One of the hardest things I ever had to do was to leave Dani after I got orders to PCS to Kunsan AB, ROK. I must have sat in his kennel with him for at least an hour and fed him a big steak before petting him behind the ears like he always loved for me to do and then telling him goodbye. 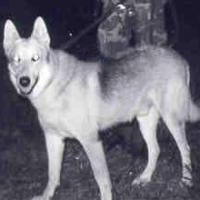 MWD: Kobuc Handler: Stephen A. Janke I received Kobuc as a 20 year old handler in Vietnam. 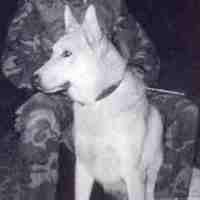 Kobuc was a sentry dog that had been in the Air Force Dog Program since 1968. On May 23, 1971 he alerted to an advancing enemy squad in the woods outside our POL fuel area. After a brief firefight and satchel charges thrown at us knocking us to the ground they retreated with the help of other Air Forces Security Forces and Kobuc helped with other teams to clear the area. I had him for my entire tour of duty in Vietnam. Twenty five years later I learned that Kobuc was one of a small number of dogs given to the South Vietnamese Army to help defend their country upon our withdrawal. Kobuc was given to the service in 1968 by Michael O'Reiley from California whom I have tried to contact unsucessfully. Kobuc helped me survive my time in Vietnam and had several other handlers before the end of the war. I still carry his picture in my wallet and think of him every day. Caesar worked with me nearly every day for 1 1/2 years in Vietnam. He was a golden German Shepherd and the best friend anyone could have. He was my eyes and he was my ears. He "covered my back" always, in every situation. I will never forget him.